Parrot is a kind of bird. It is quite famous in India. They are mostly found in the warm and tropical regions in India. Parrots are usually kept as pets at homes. They are very beautiful, intelligent and friendly in nature. 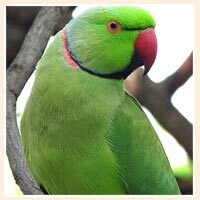 From ages parrot are important family member of traditional Indian homes. Parrots have also got importance in the great epics and religion of India.